Nintendo announced yesterday that they were going to be giving us what we've all been waiting for since launch day for the Nintendo Switch- a way to redeem our gold coins earned through their My Nintendo loyalty program on our Nintendo Switch! While certain points sound enticing, the wording is a bit incomplete, and I have reached out to Nintendo for clarification on these points. While I'm awaiting a response, I'll go over the points as laid out by Nintendo on their site, and then raise the questions that I would like answered. My Nintendo members already earn Gold Points by buying qualifying games. 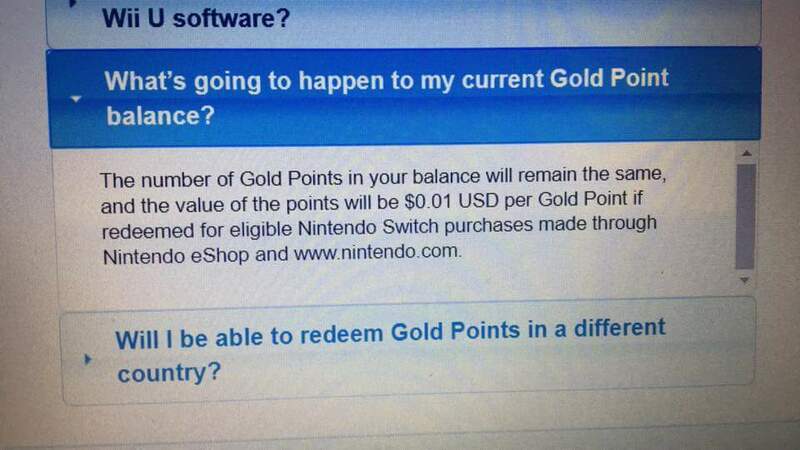 Soon they’ll be able to redeem Gold Points for eligible digital games and content for the Nintendo Switch™ system, too. • Buy a qualifying digital game for Nintendo Switch, Wii U™, or Nintendo 3DS™ family systems or a physical game for the Nintendo Switch system. • Earn Gold Points worth 5% of the amount you pay, not including any points or discounts used*. • You can then redeem those points on your next eligible digital purchase (including games and DLC) for the Nintendo Switch system from Nintendo eShop or Nintendo.com. Of course, you can also continue to redeem your points for existing My Nintendo rewards for Wii U or Nintendo 3DS systems. *Buying a physical game for the Nintendo Switch system will earn you Gold Points worth 1% of the Nintendo eShop purchase price for that game. 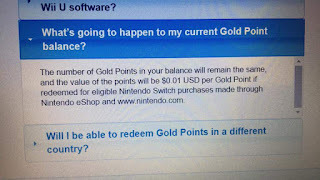 My Nintendo Gold Points expire after 12 months on the last day of the month. Visit My Nintendo Rewards Program Terms of Service for the full terms and conditions. End official Nintendo statement. Let's break this down by statement and my questions related to such. I'll also include my thoughts on the statements, as well. Nintendo later states that this will apply to games and DLC, but leaves open “content” to also include other things. Could this be an allusion to themes (which I would enjoy as a reward), and possibly the digital guides that they've already offered? What makes a game qualify as being eligible? Will it only be Nintendo developed/published games, or will it include indies and/or major third party publishers? It seems that Nintendo is putting restrictions on what you can redeem your coins on, this isn't too out of the question because there are probably legal concerns when it comes to orher publishers’ content. That's reasonable, but I'd like to know. Most of the Nintendo related content that has been released that I want, has already been purchased, so restricting it to ONLY Nintendo brand products seems like a bad move. Earn Gold Points worth 5% of the amount you pay, not including any points or discounts used*. Supposedly, each coin will now be worth the equivalent of $0.01 in USD. Under the previous system, you would be rewarded 12 coins for a full priced physical game, this translates to $0.12, or 0.2% For a full priced digital game, you would be rewarded 60 coins, or $0.60. That's still only 1%, but the new system rewards 1% ($0.60) for physical, and 5% ($3.00) for digital. This is five times as many points as the previous system, which is good, but are they planning on retroactively awarding us five times as many coins as we were previously issued for games that we already purchased? If not, this is Nintendo punishing early adopters of the system. That's potentially almost 15 million customers that will have received only 20% as much as those that chose to wait! I believe that Nintendo should be rewarding it's early adopters for having bought as much content as they did, as early on as they did. While I don't exactly expect them to give us more coins than the new rate, I feel that they should give us an equivalent amount, and should have stated as such from the very start. You can then redeem those points on your next eligible digital purchase (including games and DLC) for the Nintendo Switch system from Nintendo eShop or Nintendo.com. What if I don't want to redeem those points on my next “eligible” purchase? If I buy the new Kirby game physically, do I have to take $0.60 off my next indie purchase, or can I bank that $0.60 to be applied to a theme, or bank it to be used during a sale for another game? Can I roll that $0.60 into a larger sum so that I can, say, take $10 off my purchase of Yoshi? I'd like to be able to keep my points until I'm ready to redeem them, instead of being forced to take an insignificant discount off of my next purchase. Also, is it only ever going to be games and content, or will there eventually be physical rewards? Is it always only going to be discounts, or will I be able to use my points to buy Indies? I understand that this might just be the start, but so far it seems like launch adopters are going to have to resign themselves to getting $0.12 off a selected eShop title so their points don't go to waste by expiring at the end of March. Plus, why didn't we get points for the switch itself? Club nintendo gave points for the Wii, 3ds, and Wii u. A cool perk would be anyone that linked their mynintendo account in the first four weeks after launch could receive bonus points valued at 5% of the purchase price of the Switch- which could be a free indie, or 25% off of a full price retail game! ...you can also continue to redeem your points for existing My Nintendo rewards for Wii U or Nintendo 3DS systems. That's nice, but most of us have been saving up our gold coins for Switch rewards, which have been “coming soon" since launch day. This also makes me return to my original point- if I spend the points that I've already accumulated now, and you are going to reimburse us, do I still get reimbursed the full amount, or only what I have left? If I am reimbursed the difference between what I originally received and what the new rate will be, can I still then use those points on Wii u/3ds, or only on my Switch? Well, that's great, but we're only three weeks away from the introduction of the new Switch rewards, shouldn't we already have that information? It's not like the subscription service which is 7 months away. Now, many people will always take the *well, Nintendo doesn't owe us anything, and they could have done nothing" stance. I understand that, but when you put a loyalty system in place, the company is essentially saying that they DO want to give us something, that they DO owe us at least a little bit for adopting their hardware and buying their software to go along with it. They've sent out surveys asking us for what we'd like from the service, and I'm sure that they got tons of feedback about what they could do to satisfy us. I'm pretty sure that “$0.12 off your next eshop purchase” wasn't even one of those options. Edit- in between me writing this and finalizing the draft, someone posted this screenshot. This makes the new program worse than nothing- it's a slap in the face to everyone that purchased a Switch and games in the first year. They've also just ensured that I won't purchase anything on the eShop until March.